Lenny B. Robinson is the "Maryland Batman" who made headlines earlier this year when he was pulled over — while in costume — by state troopers in his Lamborghini Gallardo Spyder. 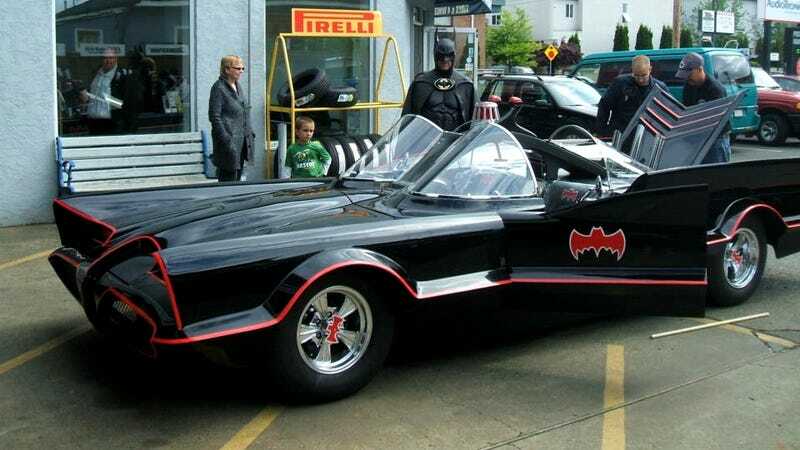 Robinson, who dons the batsuit when he visits childrens' hospitals, has ditched the Lambo and picked up a custom-made, down-to-the-last-detail Batmobile. The superhero exists because we, as a society, need to believe that whatever evil there may be in the world will be met a stronger force for good. We met evil last week, also dressed as a Batman character. Lamborghini Batman serves as a reminder that in a world where unpredictable terror occurs, unprovoked goodness is much less anomalous. Robinson took delivery of the car in British Columbia in late June, and is spending the summer on a cross-continent trip back to Maryland, supporting his charity, Superheroes For Kids. He spent most of July in Coeur d'Alene, Idaho, appearing with the car in a parade, getting some repairs done and making appearances at local pediatric centers. On Thursday night, Robinson told us, he bat-attended the local opening of Christopher Nolan's Dark Knight Rises. Robinson's new Batmobile had been on special order from BC firm Unique Movie Cars and Props, which built it to 1960s bat-spec. The original, based on the 1959 Lincoln Futura concept, was a George Barris-designed custom created for the ABC-TV show. It was first dubbed "Futura Show Car" before being rechristened for the show's title character when Batman debuted on January 12, 1966. Robinson's new Batreplica — aka "Anti Crime Roadster," in copyright-free parlance — was built from the ground up, with no donor car. It has a urethane bodyshell, worked Ford V8 and a Ford C6 transmission. It's also got period-correct on-board props like a Bat-radarscope, bat-wing steering wheel and lots of other such paraphernalia, just like the original. Pro-touring hardware wizards Craig and Art Morrison created the chassis. Unique Movie Cars and Props appears to have the replica Batmobile market sewn up — the company builds the cars primarily on early-1970s Lincoln Continental, GM station wagon or Chrysler chassis. Robinson's car, he says, was fabricated from the ground up, with a tubular steel frame, polished control arms, Aldan adjustable coilovers and urethane-bushed mounts, and sculpted shock towers. Along the way back east, Robinson plans to visit kids at the Peyton Manning Children's Hospital at St. Vincent in Indianapolis, and at similar hospitals in South Dakota, Iowa, Illinois, Ohio and West Virginia. Robinson has been visiting Maryland-area childrens' hospitals in Bat-drag since 2001 — midway between George Clooney and Christian Bale. Robinson says of his Bat visits. It feels like I have a responsibility that's beyond a normal person. And that responsibility is to be there for the kids, to be strong for them, and to make them smile as much as I can. Robinson's star-turn happened this past March, when he was stopped by cops in Montgomery County, Maryland for driving without tags on his black-on-black-with-yellow-trim Lambo Spyder (borrowed from Spyderman?). Having made the stop, Chief O'Hara (or whoever) tweeted the incident, making Lenny a star overnight.